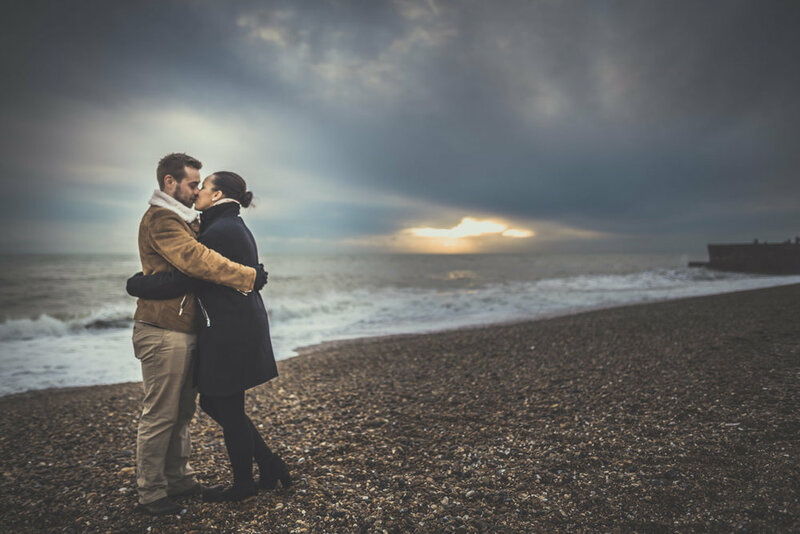 Jacqueline and Gareth met in Brighton for the very first time, so we knew when I met for the first time that Brighton will be the perfect location for their Engagement Session. Yes, it was really cold, but oh dear... they love each other so much that they didn't care. Anyway, love + sunset + beach equals to perfection! The combination makes any Engagement Session even more special... I don't know, it's soooo romantic. Especially during winter, when no many people are out there. This time though, the couple didn't decide to get into the water like the last time I went to a beach for an engagement session... thanks for that guys, I wasn't prepared to get into the water with my coat on 😅. As you can expect we had such a lovely afternoon, we had a walk and visit the West Pier, the Brighton pier, the town center and of course, the Royal Pavilion. I have such a lovely memories in Brighton, actually was the first place I went on holidays when I moved to England. If you're looking for some inspiration you must see this engagement. Don't forget to have a proper look to Jacqueline's engagement ring!! omg, so pretty. Please, enjoy this lovely engagement session during a stunning sunset and let me know what you think. Feel free to share, like & comment. I'm so looking forward Jacqueline & Gareth's Wedding this year, I can't wait! !